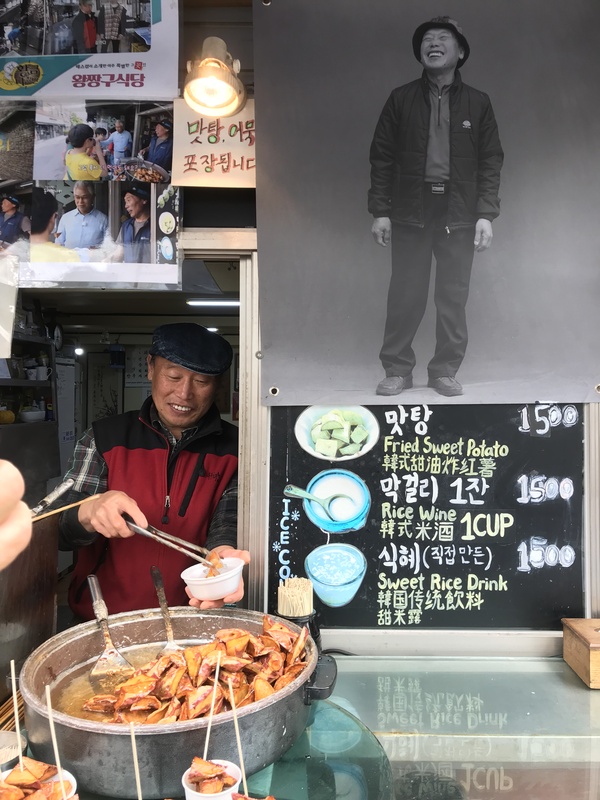 In the historic neighborhood of Bukchon Hanok Village, a local photographer made beautiful poster-sized portraits of the local vendors. This was one of our favorites because the shop’s joyful owner was so proud of the poster. No one and nothing is in your face. It has a roaring economy and a consumer culture, but feels low on glitz and class distinctions. It has a sense of style that is (except for the neon) subtle and elegant, and sometimes playful. Although the city seems to be a very homogeneous — mostly Koreans — it’s all kind of mixed up in a nice way. Ancient palaces are within sight of skyscrapers. Buzzing, old-fashioned night markets are in the alleys behind high-end boutiques. Old people, young people. Old stuff, new stuff. Almost all the sites and neighborhoods are accessible on foot or using a very modern and inexpensive metro system. Probably because the community is very Korean, there is a strong sense of Korean culture and history. The museums are user-friendly, including free. 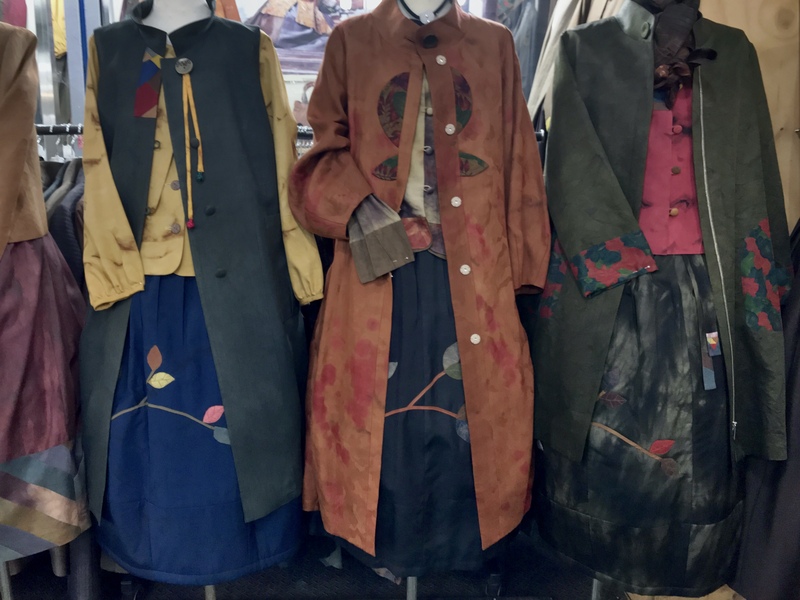 Locals wear traditional dress to visit the sites, and the newer clothing styles are designed with traditional lines and fabrics. 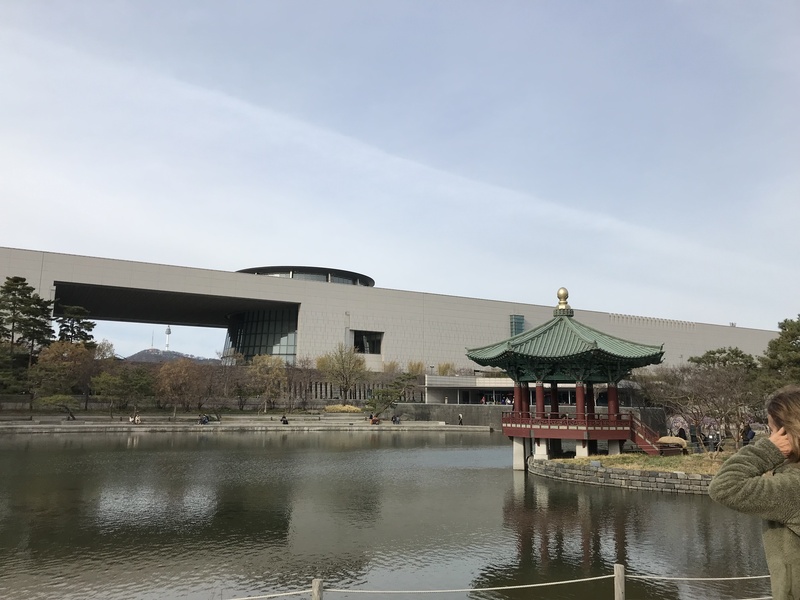 The National Museum of Korean History is in a huge park that encourages picnics, children and hanging out. 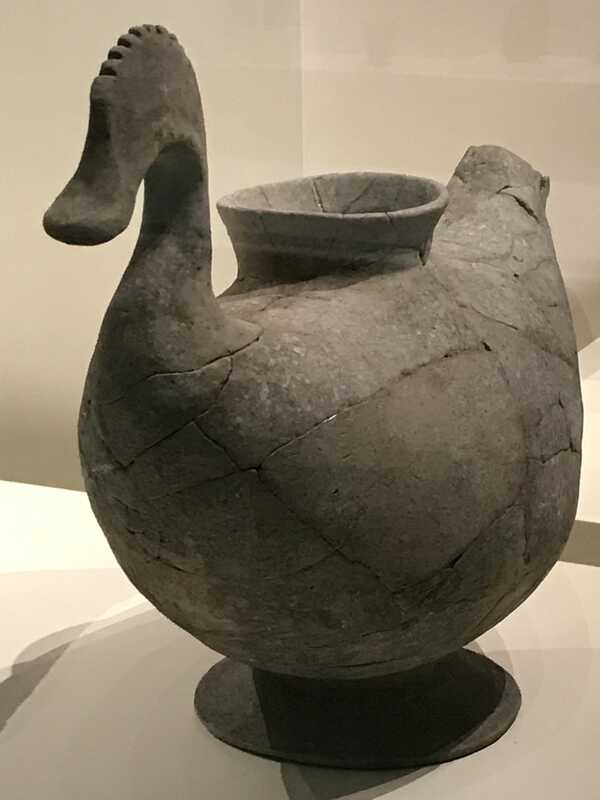 One of my favorite historic details – Koreans believed that birds accompany souls to heaven so bodies were buried with duck urns. 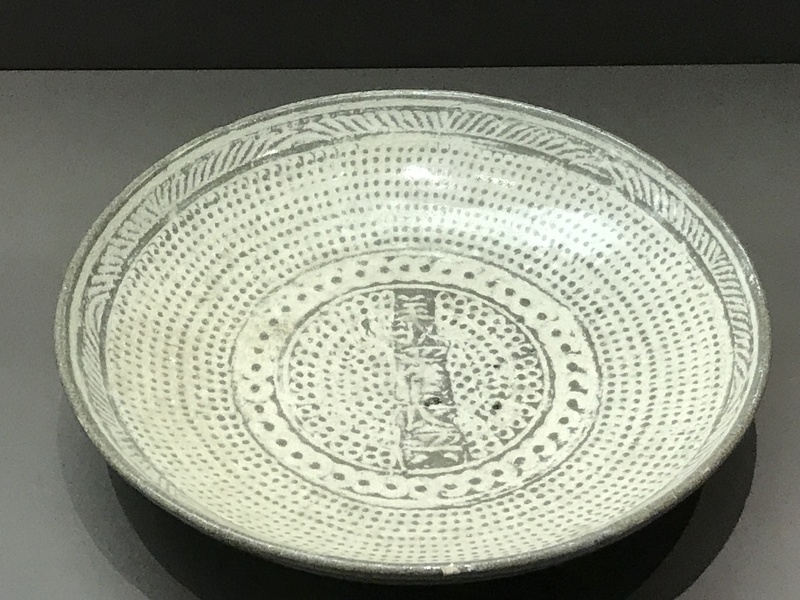 Korean ceramics are famous, especially celadon. 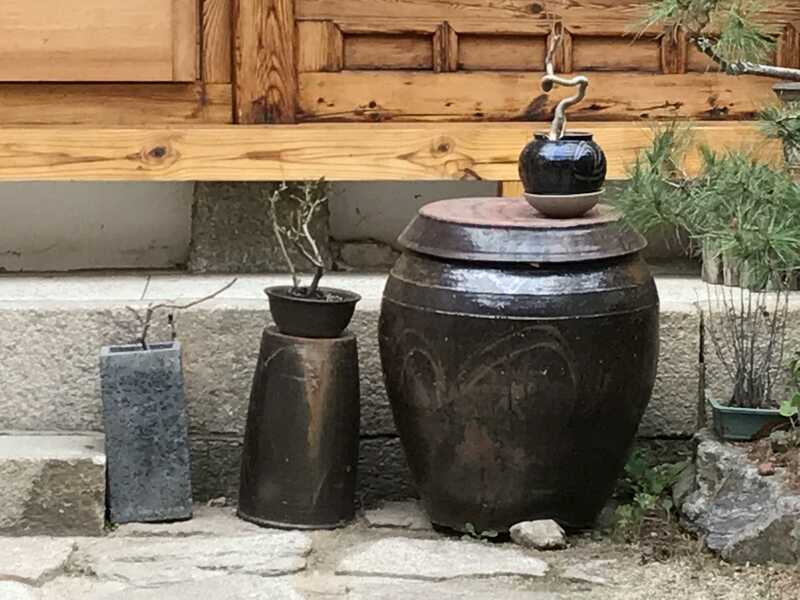 I loved the subtle detail of the less refined Buncheon pottery used by government bureaucrats more than 500 years ago. 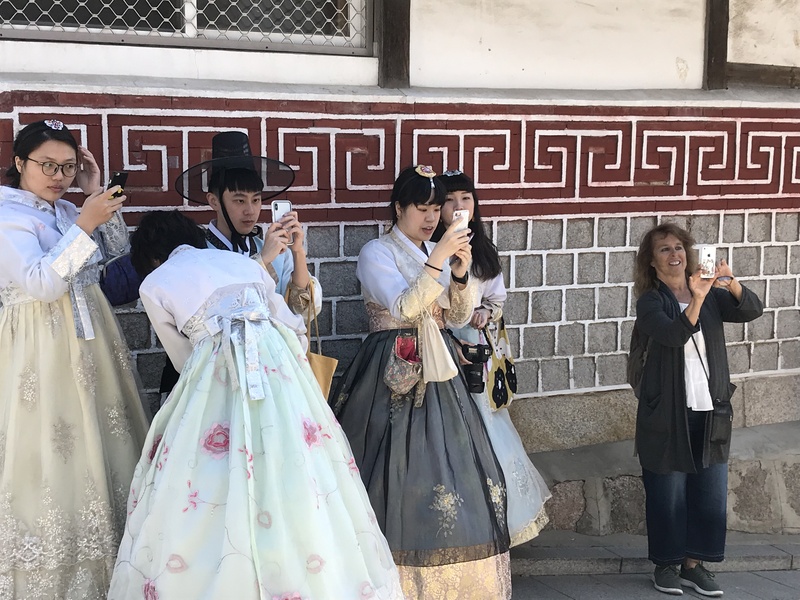 Diane joins a group of people in traditional “Hanbok” dress for a photo shoot of people dressed exactly like them. The food here is very meat-focused. Or maybe it’s not in some places but I can’t tell because I can’t read Korean and I haven’t learned “I am a vegetarian” in Korean. In the Korean alphabet, it looks like this. and is spelled like this in English: “naneun chaesigjuui jaida” Still not sure how that’s pronounced. 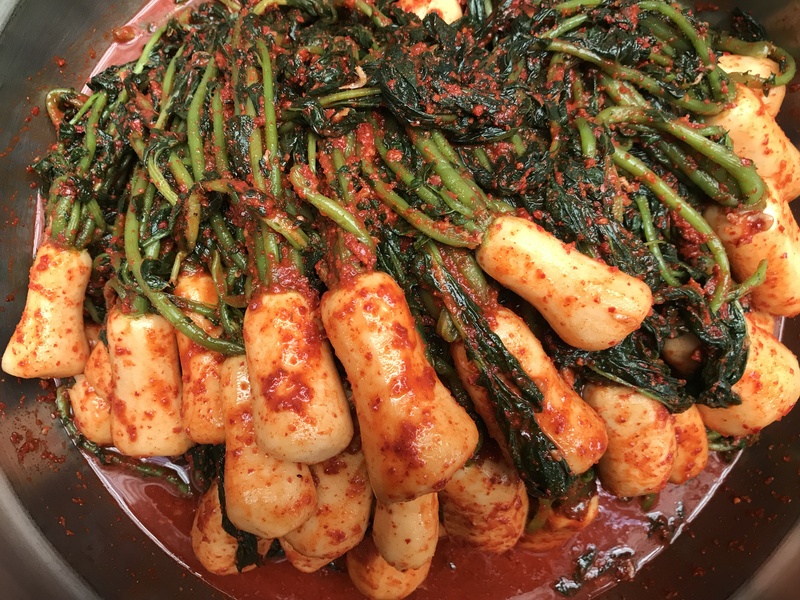 Anyway, I have not gone hungry — among the vegetarian specialties are onion pancakes, bibimbap (rice and vegetables), miso-based soups, and fermented vegetables, like kimchee. 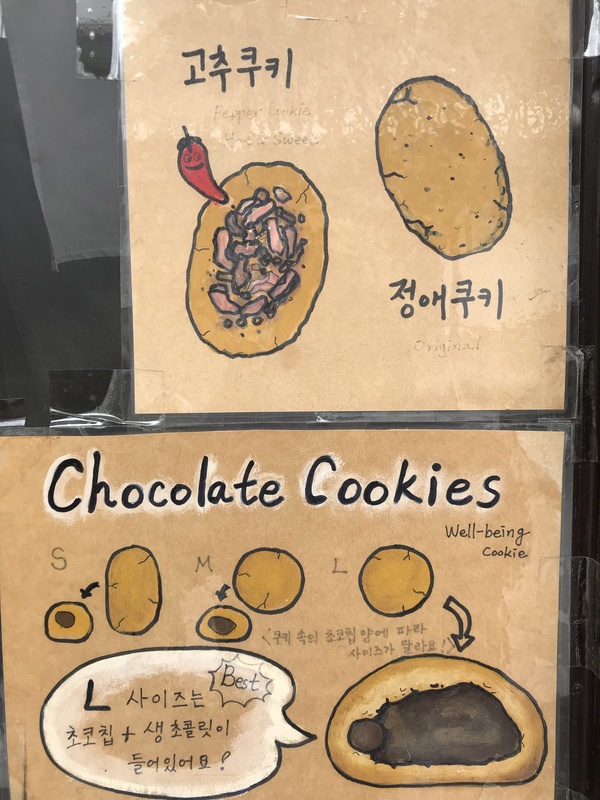 Seoul also loves bakeries. 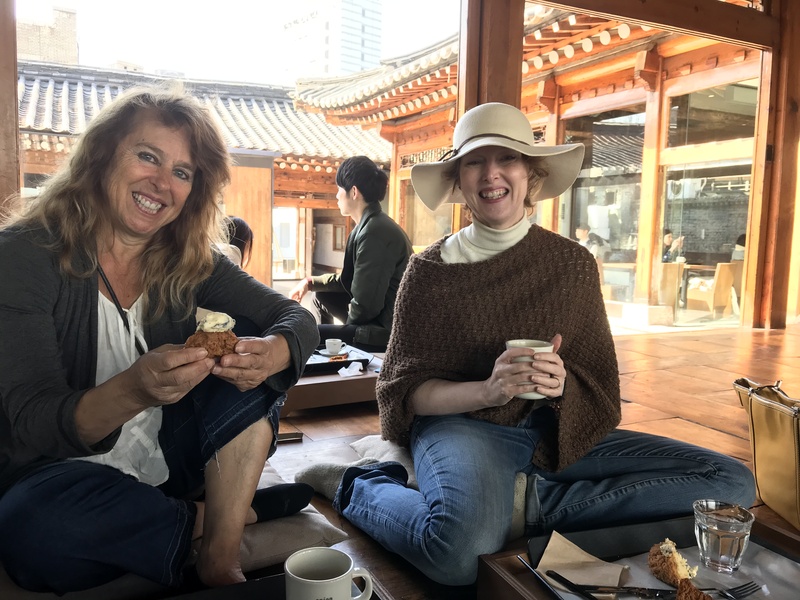 My travel buddies, Diane and Lisa enjoying breakfast at hipster bakery, Onion, where stylish 20-somethings spend more time taking selfies than eating, which is probably why they are all fashionably thin. 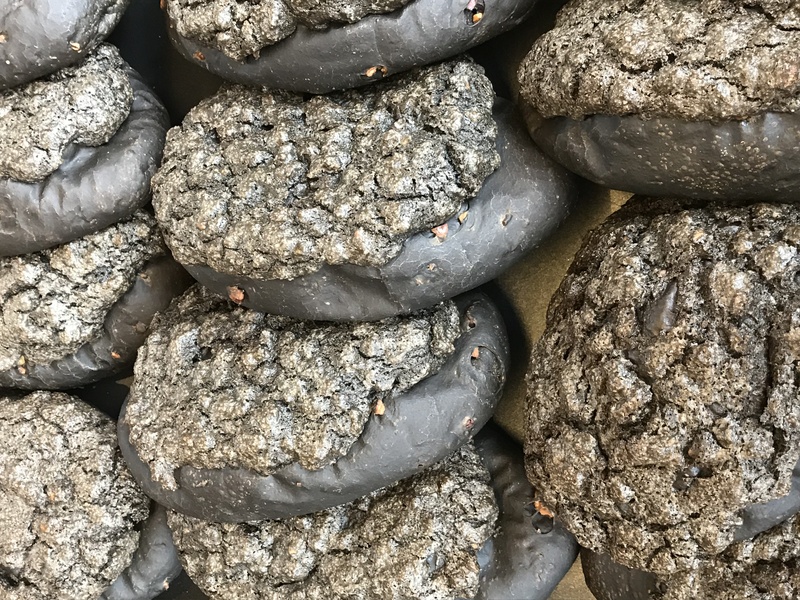 A bakery specialty made with cream cheese, meringue and squid ink, which makes the bread black. Hi Karen, we had originally planned to take the ferry from Busan to Fukuoka on Japan’s west coast but the trips are famously rocky and I am (very) prone to seasickness so we are flying. I will check out your FB post! Fascinating, Kim! It’s so different from what I imagined. 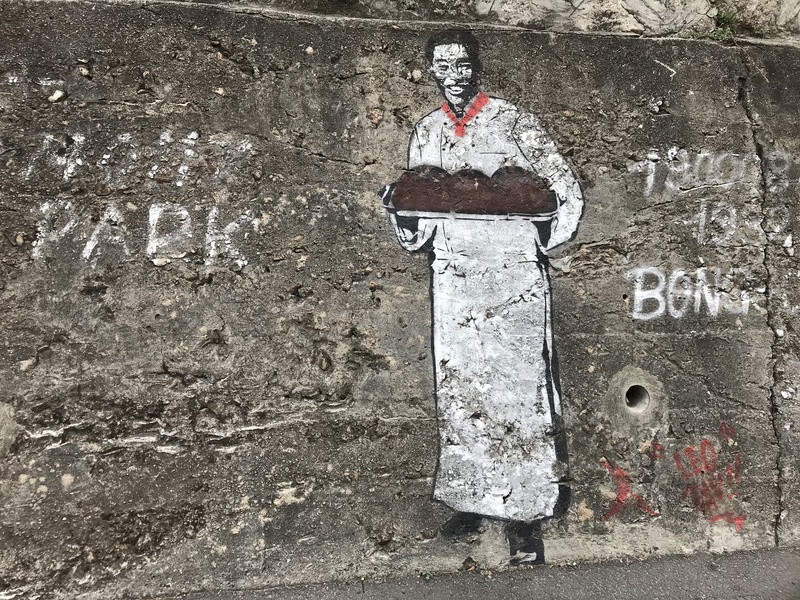 The street art, the clothing, the bakeries, and that lovely quote at the end… lovely! Yes, I didn’t expect to love it so much! Such a wonderful report Kim! 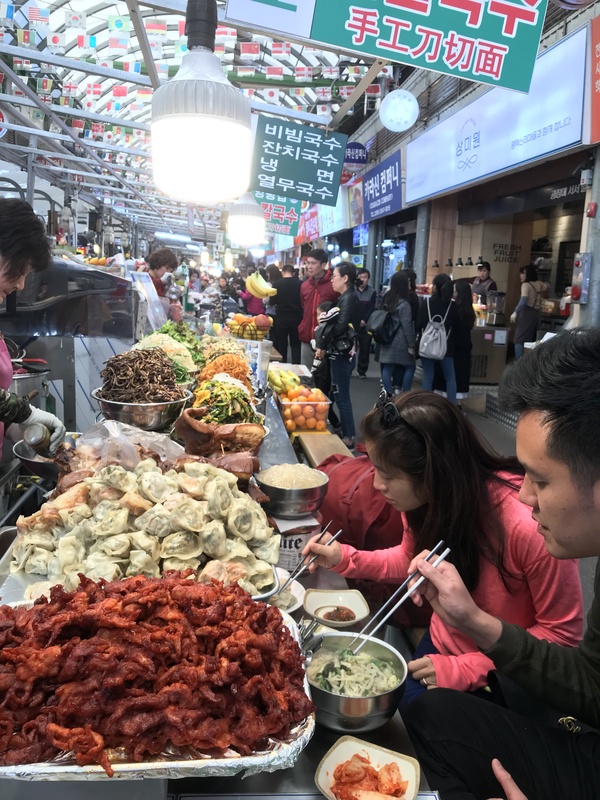 My extremely brief time in Korea was spent mostly in the Seoul CBD in and among the skyscrapers and neon lights so I didn’t get see any of the wonderful sites and neighborhoods you visited. Reading your account along with your fab photos makes me realize how much I missed. 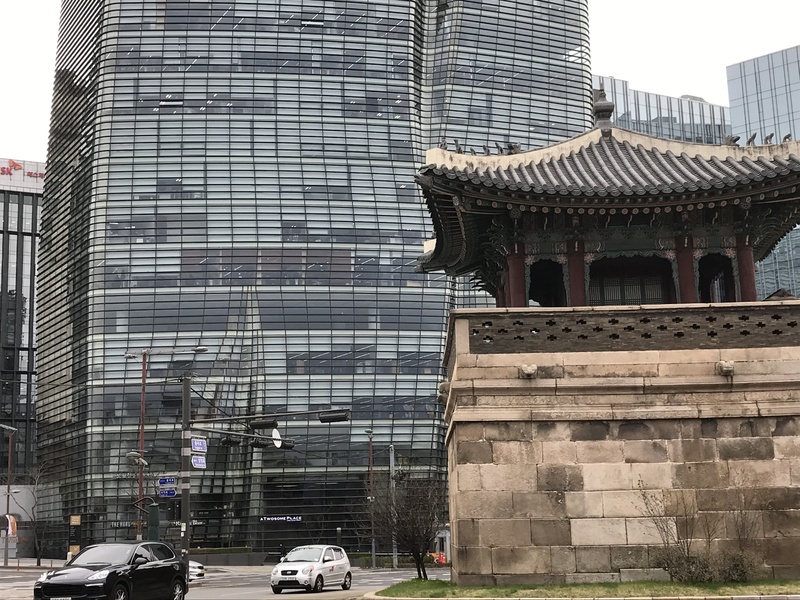 Seoul is one of the world’s GREAT cities! Enjoy your time there with good friends. I love traveling with you, Kim.